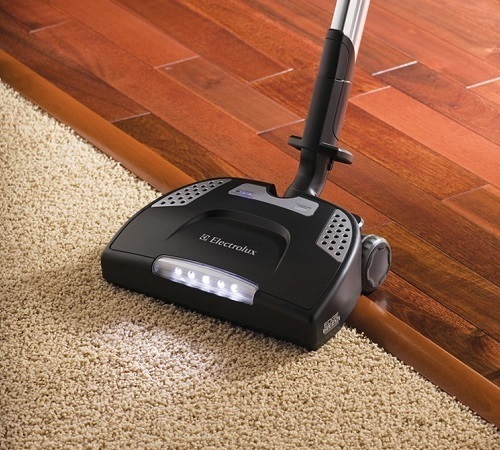 The power head can be used for smooth floors or carpeted surfaces. Its cleaning path is 13 inches wide. It auto-adjusts to the height of the carpets. The height adjustment can also be controlled with a foot-pedal, with Leds showing the height of the brush. There is an auto shutoff of the motor if something gets tangled in the brushroll, and another Led to warn the user if that happens. Auto shutoff with indicator light if something gets caught in the power nozzle brushroll. The bare floor brush is intended to take care of your hard floors. The dusting brush and upholstery tools can be clipped on the handle for easy access. 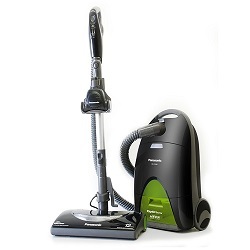 The JetMaxx EL4042A uses auto-seals S-bags, which trap the dust when you replace them (12 bags are provided with the vacuum cleaner). It is also equipped with a washable HEPA filter, to eliminate small particles and allergens. There is also a permanent filter protecting the motor. 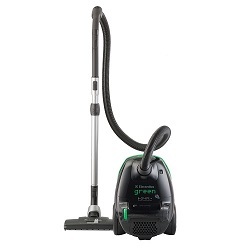 The Ergospace Green is very efficient on carpets and rugs, thanks to its high suction and to the power-head floor tool. Many accessories are provided, making the JetMaxx EL4042A versatile and efficient on all kind of floors. The suction can be adjusted with a power selector wheel on the canister. There are also controls on the handle to set the power-head mode : off (O), on/bare floors (I), and on/carpets (II, with the brushroll on). The hose link to the canister can rotate at 360 degrees, which improves the maneuverability. The HEPA filter eliminates the small particles and allergens. The bags have an auto-seal closing, which seals the dust inside when you replace them. We appreciate the 12 bags provided with the vacuum cleaner. An indicator light warns you when the dust bag is full. The bare floor brush cannot be stored on the canister. The bag capacity is quite small (1.3 qt), which implies frequent changes especially if you have a large house. I have only used this for a short time, but am already impressed with it. It was easy to assemble out of the box, and worked immediately – no tweaking, long hours of studying the manual, etc. Features and functions were fairly easy to see and use.It is a canister vac with an extending wand on the hose, and many attachments. Most of the attachments are the the standard; brush, crevice tool, smooth floor tool, etc. 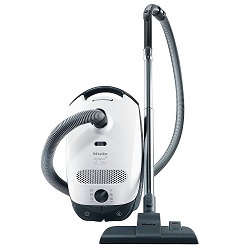 It also has a detachable power head for carpets which works nicely. The hose does not reverse to allow its use as a blower. The power head has a very flexible joint that swivels to nearly flat sideways to get under furniture, etc. It has a bank of LED lights on the front and is sort of self propelled, at least it felt that way (perhaps the beater brush was just that strong . . .). The electrical connections are fairly solid pins, with no loose cords hanging around to get tangled or caught on things. They looked pretty solid and the parts fit together well.It produces a good amount of suction and is easy to use. The large wheels make it roll quite easily, and the canister is easier to maneuver than any other canister I have used. I also noticed that it did not build up static electricity they way another plastic-bodied canister vacuum I have does. The manual describes routine maintenance like changing bags and belts, and there is a parts list of replaceable items. There are 2 filters in addition to the bag itself, and it seems well designed. 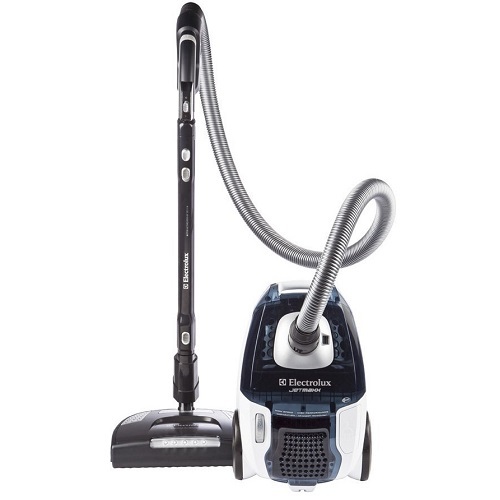 The Electrolux JetMaxx EL4042A is an efficient canister vacuum cleaner, with many accessories for both hard floors and carpets areas. Its noise level is average for a bagged vacuum cleaner. Since the bag capacity is below average, this is a good choice only if you have a small home. Otherwise, it would be more convenient to choose a vacuum cleaner with a larger capacity.